If you’re looking for an genesis-style atomizer, here’s a great deal on an Origen Genesis V2 atomizer clone. An authentic Origen Genesis RBA (made by Norbert) retails for $100+, but you can get a clone for a fraction of the cost. 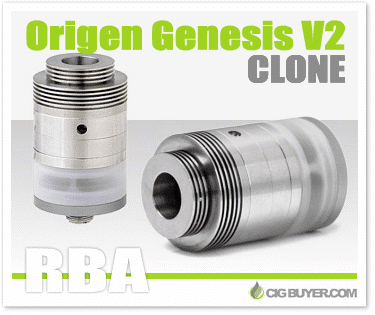 These 1:1 genesis clones are made from stainless steel with a 4ml polycarbonate tank. The deck is designed for dual-coil builds (cotton or wire mesh) and the adjustable airflow system allows for plenty of control. The heat sink fins on top help to dissipate heat and give it a nice, clean look. Several Chinese vendors carry the Origin Genesis V2 clone, but Gear Best has the best deal of just $13.99. Try Fast Tech for just $16.72; but in either case, pay significantly less than the original. Expect 2-3 weeks for FREE shipping. * No special coupon codes are required. Good while supplies last.